If you’re planning a wedding and wondering how to decorate or display your pictures, I’ve got you covered. I love weddings and feel that incorporating pictures into your wedding or reception décor is a wonderful way to share your special day with your family and friends. Whether you want to display pictures of your families or you want to showcase your relationship from the first day to the wedding day, these DIY wedding photo display ideas are for you. From rustic pallet displays to balloon chandeliers that beautifully dangle your photos for your guests to admire, there is an idea in here for every wedding theme and venue. Many of these are perfect for decorating a rustic wedding venue and they’ll work just as perfectly for outdoor backyard weddings or even if you are planning to celebrate your nuptials in a rustic barn. Speaking of rustic weddings, you should really check out these 35 DIY rustic wedding decorations. They’re all easy to make and perfect for that country wedding. 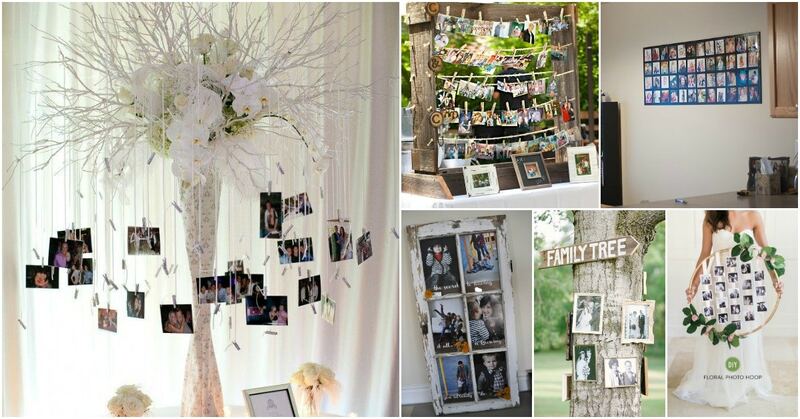 From full on pallet displays to hanging pictures on a tree and even a wonderful idea for creating a floral hoop with your favorite pictures, there is something in here that is going to help you to beautifully display all of your photographs on your wedding day. 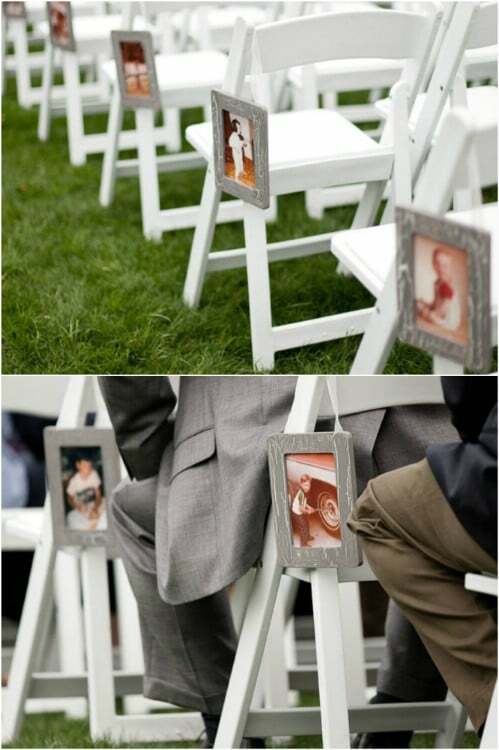 There’s a great idea for adding photos to your aisle seats for the wedding and even some great photo centerpiece ideas. And, you should really check out these beautiful DIY wedding favors that your guests will actually want to take home! If you are planning your wedding and are doing your own decorating, these DIY wedding photo display ideas should come in really handy. 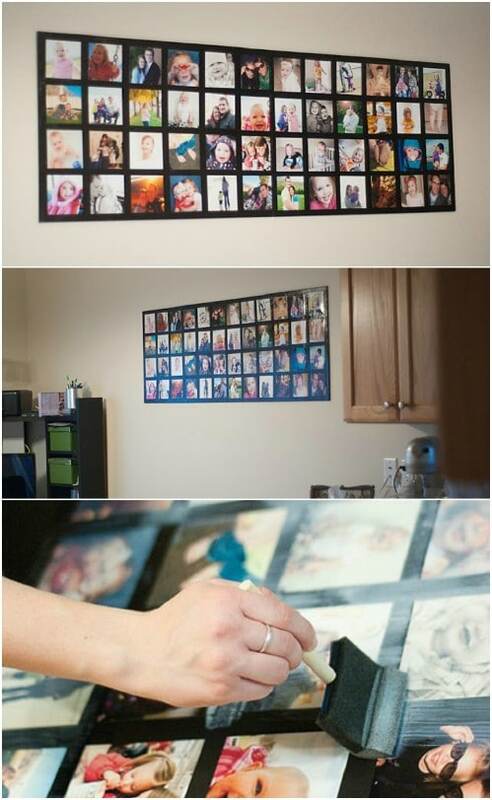 They will take the work out of displaying those pictures and they’re all so cheap and easy to make that you won’t have to worry about blowing your decorating budget. They’ll save you money that you can spend on your honeymoon! If you need a nice way to display your relationship or family pictures during your wedding and you want really great aisle décor, these decorative aisle frames are great. Just choose the pictures that you want to display and put them all in frames. You can get really cheap frames at the Dollar Store or Dollar Tree and then just hang them with ribbon, twine or burlap to the end seats for each aisle. Not only are these balloons perfect for decorating for your wedding or reception, they’ve got pictures attached to the bottom so you can showcase your relationship photos. 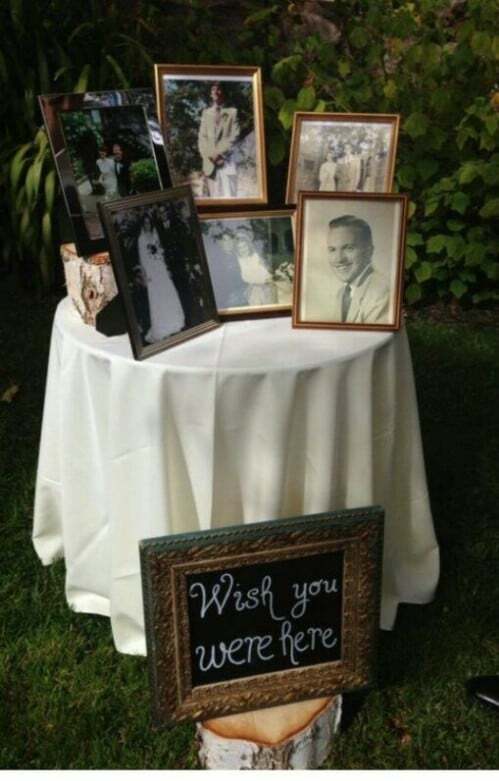 This is one of the easiest ways to incorporate pictures into your wedding decorations. Just fill the balloons and then tie pictures to the bottom of the ribbon. You can use cardstock for the pictures so you don’t have to tape or poke holes in your actual images. I love this bicycle tire photo display, especially for rustic outdoor weddings. 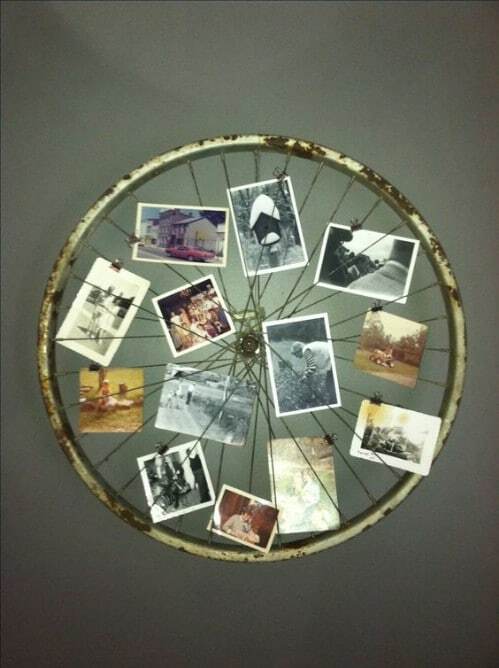 You just take an old bike wheel and add your pictures, holding them in place with ribbon or even tiny clothespins or metal clips. You could hang these all over your backyard for a great backyard wedding or have them propped up on tables if you’re having your wedding and reception indoors. 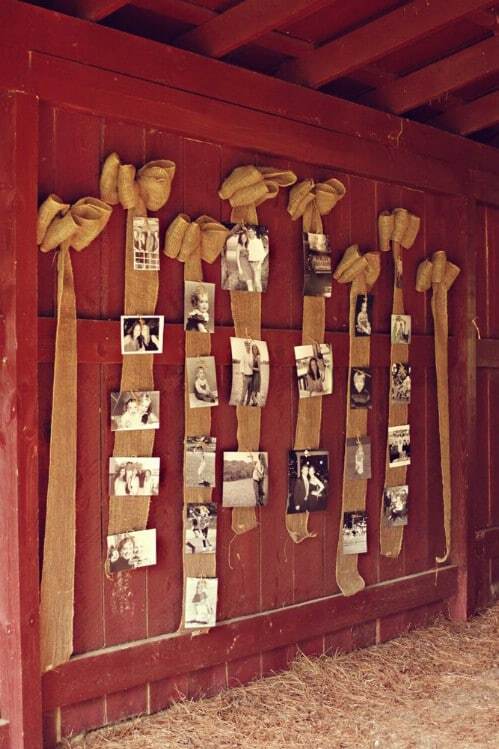 If you’re going for a rustic look for your upcoming wedding, this burlap and lace photo display idea is perfect. You just create burlap bows, leaving a long ribbon of burlap for attaching your photos. This would look beautiful hanging on the side of a barn or your house if you’re having a backyard wedding. It’s also really easy and pretty cheap to make. If you’re planning to have a wedding program printed up and you’re getting married outside, these photo fans would be the perfect way to showcase your relationship photos. Fans make me think of old country churches and these would be beautiful as part of your wedding décor. You could put them in a wooden crate at the door to your venue and let guests pick one up as they arrive. This driftwood photo display is great if you’re planning a beach wedding – or a beach themed wedding if you’re not lucky enough to actually get married on the beach. This would also work for rustic country weddings. Just tie twine or fishing line to a piece of driftwood and use that to hold your photos, which you can laminate or place on cardstock to help protect them. 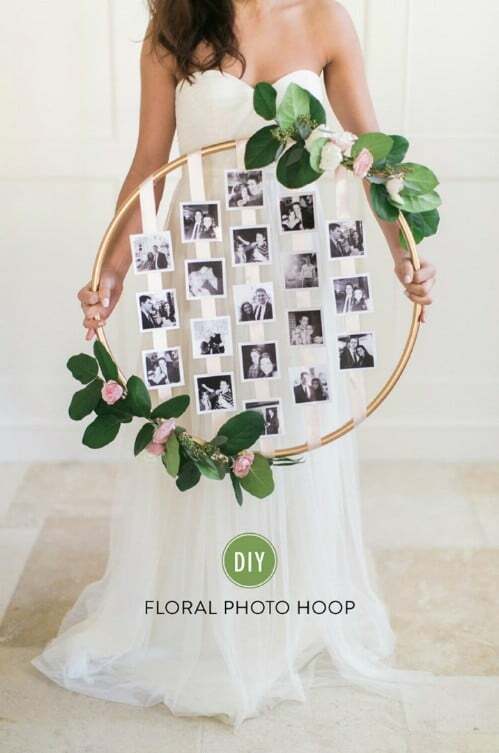 A hula hoop, some paint and ribbon are all you really need to create this stunning floral hoop photo board. You just spray paint the hula hoop in whatever color you want and then use ribbon to run through the hula hoop and hold your photos. I love the floral decorations on both sides of the hoop, although you can skip this and use burlap or anything else you need to match your wedding décor. If you have a lot of photos – maybe you want to display pictures of your relationship and all of your family members – this photo collage is a great way to show them off. The entire photo display will cost no more than $20 and it’s made with foam core boards and a few other craft supplies, many of which you may already have on hand. It’s an elegant board that is perfect for showing off multiple pictures. 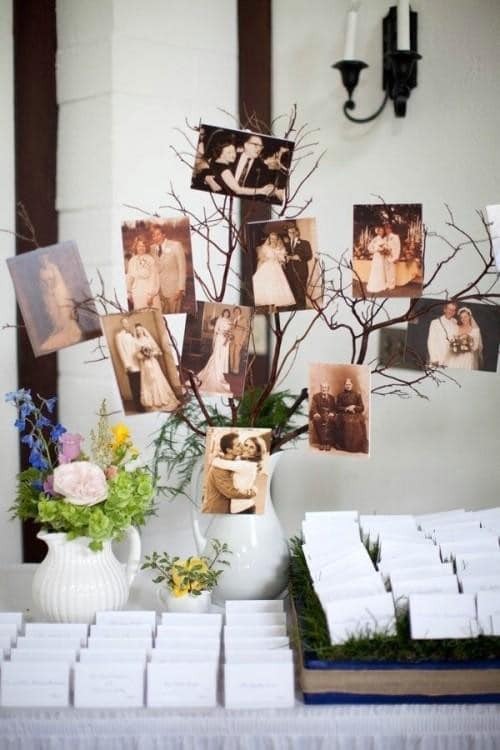 You can turn a tree into the perfect display board for your photos and wow your guests at the same time. I love the genius of this idea. It’s gorgeous and it perfectly showcases those photos. 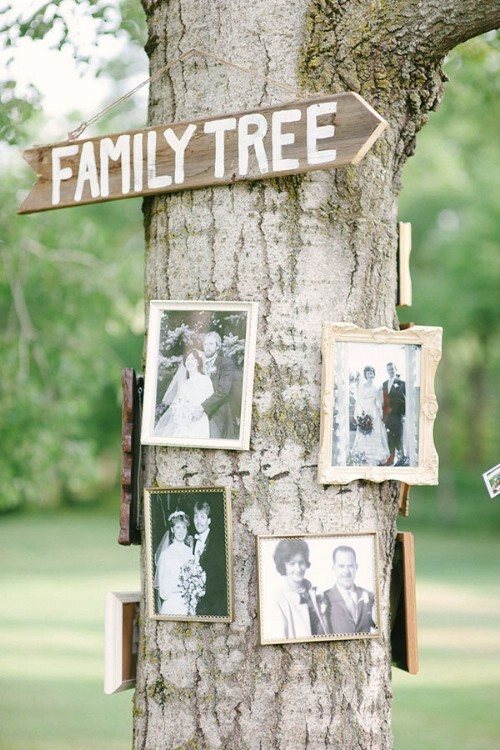 If you’re doing family photos, a Family Tree sign at the top would be really cute. You just put your images in frames and then hang those frames on a tree. Be careful not to hurt the tree. You can wrap ribbon around or wire and attach your pictures to that or use those adhesive picture hangers. If you’re not outside or don’t have a tree to hang your pictures from, you can create your own with branches and twigs. Just gather up a few twigs and sticks – however many you need – and place them in a vase. 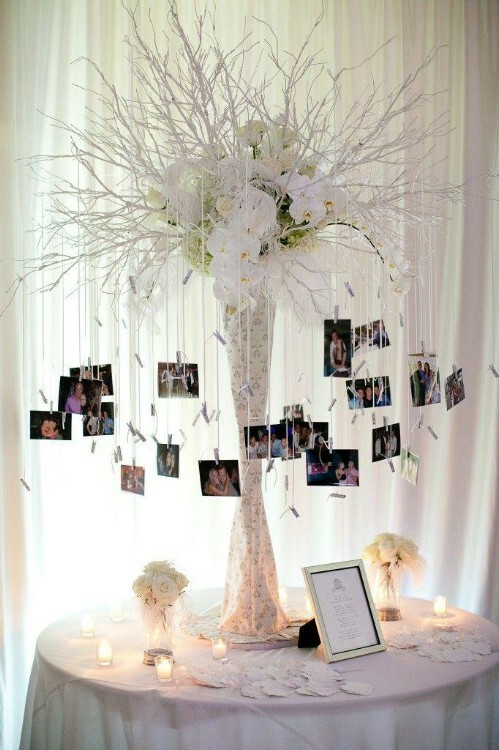 Use those branches to hold your pictures that will be hanging from ribbon or twine. You can paint the branches to match your wedding décor or leave them as they are if you’re going for the rustic look. 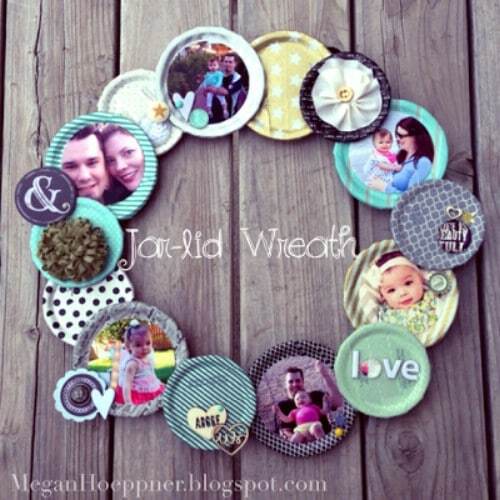 If you have a handful of mason jar lids, you have what you need to create this lovely photo wreath. To make it, you just cut your pictures down to size so that they fit in the lids. You can cover the lids with fabric or burlap or even paint them to match your wedding décor. Then just assemble them together and decorate with ribbon or whatever you need to match your other decorations. I really love decorating with old ladders. They just have such a wonderful rustic quality and you can use that rustic quality to decorate for your wedding and add your photos. Just take that old ladder and cover the rungs with ribbon or fabric (You don’t have to do this step but it certainly makes it more decorative). Then add your photos and stand the ladder up – or hang it sideways on a wall. These mason jar photo frames would be perfect for outdoor weddings, particularly those at night. 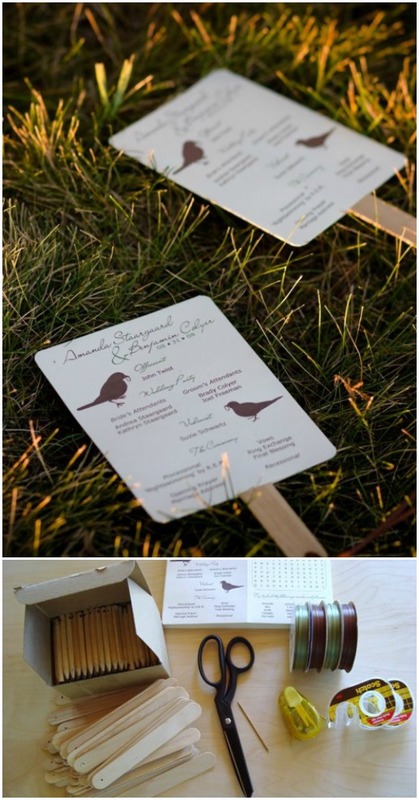 They’re also great for placing on your reception tables and they can double as wedding favors. Just fill mason jars with vegetable oil and add in a black and white photo. The oil will preserve your picture and give it a really great aged look. You can also add in sprigs of your favorite flowers to give these a wonderful scent. Your mood on your wedding day should be all sunshine and roses, and that’s just what you can put on this DIY mood board. This is an easy display board that’s made with an old frame and some wire. You can add any decorations you want and then choose the photos that you want to display on your special day. These can be hung in any wedding or reception venue or propped up on a table. If you’re going for a rustic wedding theme, this window photo display is an absolute must. You just need an old window or two – and you can get these at thrift stores and yard sales for very little. Just clean the window up and then add your photos so that they show through the panes. You can also paint and distress the windows if you need them to better match your rustic theme. I love using pallets are all sorts of decorating and rustic crafts. This DIY pallet photo display is one of the easiest pallet projects I’ve seen and it’s perfect for rustic wedding decorating. It’s not even that difficult. You just take the pallet and string rope or twine across it and use those strings to house your photos. 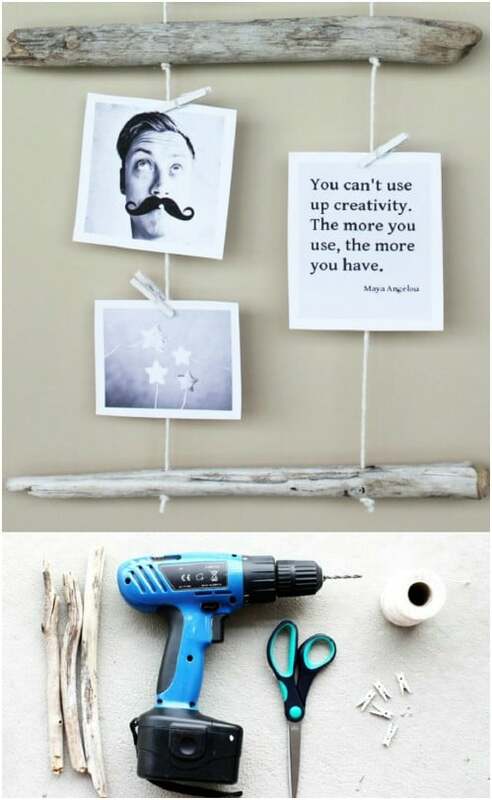 You can hang them pictures up with tiny clothespins for a really great rustic touch. You can show off your initials and use up some of those photographs at the same time with these decorative photo collage letters. The letters themselves can be used to decorate any number of things throughout your wedding and reception and you can have images of your relationship or family members incorporated in the letters to give them a great look. You can use your photos to create the names or numbers of your tables. Just give your tables names that coordinate with the images that you’ve chosen to display. This gives you a great way to stick to the seating chart and acts as a table centerpiece as well. Or, if you really want to put some time into it, you could have images of all of your guests and use those images to mark their seats at the reception. Turn those images into a beautiful table runner for your main reception table. This would also be great on the gift or cake table. 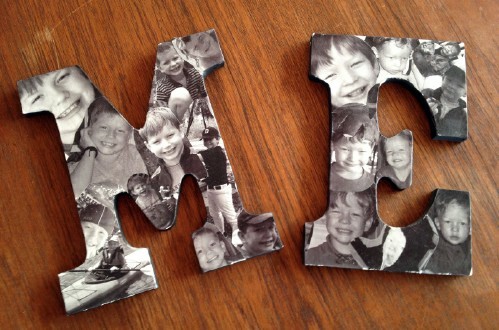 Just attach your pictures to a piece of fabric or burlap using hot glue. Then once the glue has dried, you can lay the runner across the table and it will showcase all of your favorite photographs. If you’re using the table runner on a useable table – one where people are going to be eating – then maybe just add the images to the bottoms of your fabric. These little accordion wedding favors sport your favorite pictures throughout your relationship and give your guests something wonderful to remember your special day. These take a little time but they’re definitely worth it. You not only get to show off your relationship through pictures, you get to make your guests feel really special when they take a bit of your special day home with them. 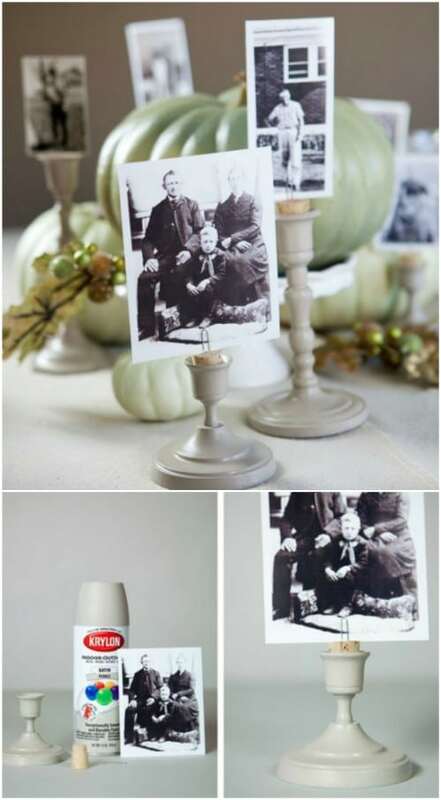 This photo centerpiece idea is really easy and you can do these for very little money. If you don’t have the candlesticks to use, check with your local Goodwill or other thrift store or look around at yard sales. You can get them really cheap. Then just add a cork with a paper clip that holds your photo. You can use these as centerpieces for all of your reception tables. 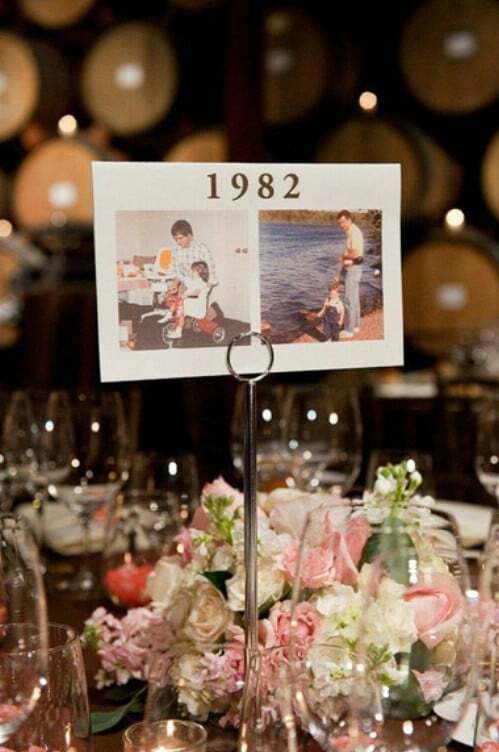 Here’s another great centerpiece idea that incorporates your photos into the design. If you have a floral centerpiece, just use tiny clothespins to hold photos on your centerpiece. Or, you could dangle ribbon down from the leaves or stems of your flowers and attach your photos like that. 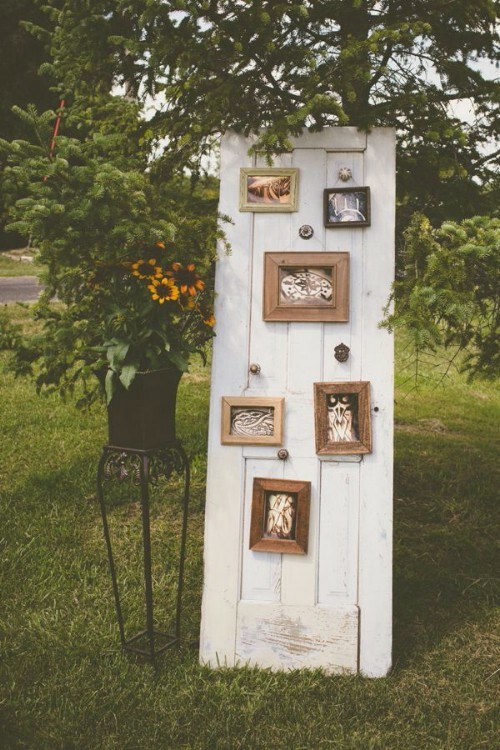 Turn an old wooden door into the perfect rustic photo display for your wedding. You don’t even have to do much here. Just clean up the door and maybe paint and distress it if you want. Then use it to hang your pictures. You can hang this up or prop it up against a table or a tree if your wedding is outdoors. 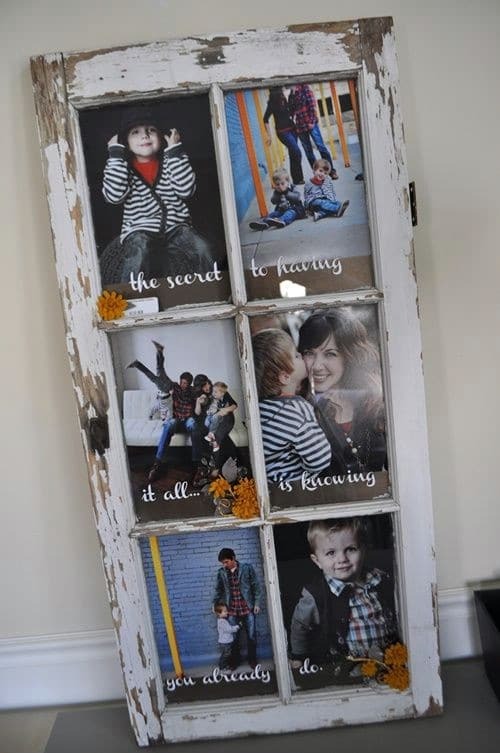 Frame the pictures or leave them unframed and hang them from wire with twine or clothespins. I love using upcycling or repurposed items in wedding decorating and this shutter photo display idea is one of my favorites. You just clean up an old shutter – paint it if you need to – and then hang your pictures from it. Clothespins will perfectly fit into the slats of the shutter and hold your images in place, or you could hang twine or burlap if you wanted to add a nice country touch to it. You want all of your loved ones by your side on your special day but unfortunately, this doesn’t happen for some brides and grooms. I think it’s a beautiful thing to honor your late loved ones during your ceremony and I’ve seen several weddings that had this type of addition to the service. You can set up a table with the pictures of your loved one – or loved ones – and add a candle that you and your soon to be can light together in their memory.